Interview with the Australian artist based in London about his public artwork and studio practice. This interview first appeared in Sculpture magazine, 24(2), pages 22-3 in March 2005. 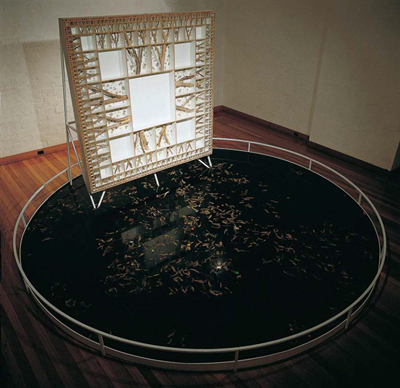 Simeon Nelson art: Pollinator Phenotype (cactal), 2001. Recycled polypropylene sheet and acrylic paint, 320 x 900 x 1,100 cm. 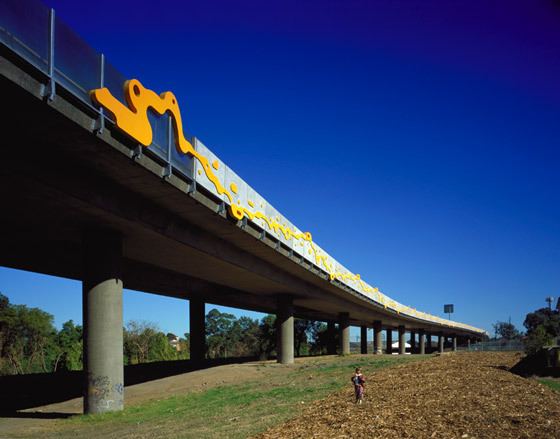 Some of the highlights of Simeon Nelson’s career include representing Australia in the 9th Triennale, India (Delhi, 1997) with his installation World Between (1997–99) and installing a freeway-based public artwork on the M4 in Western Sydney (2000). During the same year, he was the recipient of a Pollock-Krasner Foundation fellowship. In 2002, he was one of eight artists shortlisted for Britain’s 2003 Jerwood Sculpture Prize. Nelson has also exhibited extensively in Australia and in Asia, and he is showing more frequently in Europe, especially since moving to London in 2001. R.J. Preece: Why did you move yourself and your family from Sydney to London? Simeon Nelson: It was a joint decision between me and my partner Deej, who is also an artist. She wanted to be with her family and I have always been intrigued by England, having been born here. I had been dropping into London since 1995 and was becoming increasingly interested in the scene. Also, getting into my late 30s, I decided it was now or never. R.J. Preece: Has it been all flashy art openings and living the Cool Britannia art lifestyle that we keep hearing about? Simeon Nelson: Yes, there is that aspect to it. There’s a glamorous lining to a rather gray and dank envelope sometimes. Bad weather. Subway derailments. Going to work in the dark. Really busy. Incredibly expensive. But London is an amazing city. There’s a lot of passion, a million debates. Anyone can find their niche as an artist. Simeon Nelson art: View of Architectural Epiphyte #4 (2000). Glass-fiber-reinforced concrete and acrylic emulsion, 3,000 meters long. Work installed on the M4 Freeway in Western Sydney, Australia. R.J. Preece: How did you get interested in the visual and structural relationships between nature and technology? Simeon Nelson: When I was very young in 1967, we moved from the U.K. into a house in the northern suburbs of Sydney. I was installed in what was a girl’s bedroom— pink, flowery, tacky Rococo-style wallpaper with representations of nature. Outside the window, there was a bird sanctuary-like forest— like a picture of “real” nature. I lived in this room for two years until it was redecorated. I must have been working it out ever since. In my youth, I also used to spend a lot of time staring out of a car and looking at street maps. At art school, when I was about 22, I got serious about it. R.J. Preece: And what are your current interests? Simeon Nelson: First, the representation of nature in art and science— like the way that science paints pictures of the world and the way art does it. How these representations influence the way we see nature— for instance, a picture of a solar system or atom shows things we can’t actually see. Second, digital technology. I work in dualities. I equate a pixel— an indivisible unit on a screen— with a particle, like a particle of matter, an indivisible unit, as represented, but with far larger units, by Pollinator Phenotype (cactal). R.J. Preece: What do you consider to be your artistic and other influences? Simeon Nelson: They range across art, science, design, and architecture— how nature is represented in early to mid-century modern. I’m interested in how those radical ways of seeing nature are filtered down into vernacular awareness, as in 1950s flooring and wallpaper. I’ve also been influenced by Arte Povera, Robert Smithson and other Land artists, and Hans Haacke, as well as lots of others, such as the writers Oscar Wilde and Ralph Waldo Emerson, and miniature golf courses. 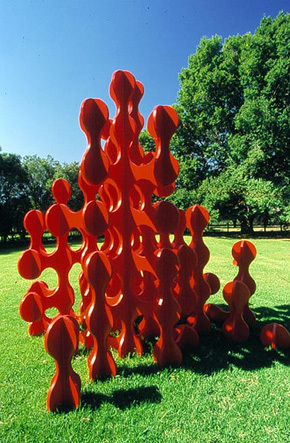 Simeon Nelson art: World Between, 1997–99. Steel, MDF, water, branches, PVC, and detritus, 270 x 600 x 600 cm. R.J. Preece: Could you explain your artistic process in World Between (1997–99)? Simeon Nelson: That was a long process that involved gathering of a lot of organic and artificial material. I spent six months carefully sorting through rubbish in Sydney Harbour— for its color values, the right mix of seaweed, condoms, and bird skeletons— all the crap that washes up on the beach. Then I decided on a six-meter-wide circular tank— a representation of the world, filled with decomposing crap. Beautiful crap. Rising out of the tank, I made something that looks like a billboard, with a big central square in the middle. When you move outward, the mapping gets smaller, more finely “pixelated.” Then I “vivisected” a tree and put it in a hyper-fanatically ordered box. After installing it in the gallery, the smell got worse as you went along. R.J. Preece: What aesthetic and practical challenges did you face in designing and constructing your freeway project, Architectural Epiphyte #4 (2000)? Simeon Nelson: Relatively few, surprisingly. The political will and money were there. I worked very well with the architects. The highway authority wanted to put something on the freeway because it runs past the Olympic site— they wanted to tart it up. And there was quite a lot of money. Simeon Nelson art: Another view of Architectural Epiphyte #4 (2000). Glass-fiber-reinforced concrete and acrylic emulsion, 3,000 meters long. 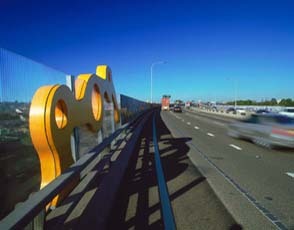 Work installed on the M4 Freeway in Western Sydney, Australia. R.J. Preece: What materials are your favorites? Simeon Nelson: I love working with organic materials, like those in World Between and Landscope (1993–94). There’s a sensuality there. They’re always changing. You come back a week later and it’s different. Really any material that fits the concep: there’s that very fragile process of finding the right materiality to make the idea resonate. It makes the idea real. R.J. Preece: Some artists, including Australians, might be looking at this interview closely. You’ve done rather well in London. And maybe they think they can too. So, what advice do you have for them? Simeon Nelson: Have something to contribute. Get to know the right people— for you. And bring lots of money.